For eight years, the inhabitants of Temacapulín, Acasico and Palmarejo in Jalisco, Mexico, have been resisting the disappearance of their town or village. The construction of the El Zapotillo dam on the Rio Verde, as planned by National Water Commission (CNA) would have taken care of that. The announcement by the Jalisco governor that the height of the concrete wall will be set at 80 metres instead of 105 will saves the biggest town – Temacapulín – from flooding. For those who visited the historic sites of Temacapulín, enjoyed its thermal waters and experienced the hospitality, the decision not to flood them makes a lot of sense. Just think of who would have benefited from a higher dam. The bigger reservoir was supposed to contribute to the water supply of the Guadalajara metropolitan area. But water experts and even citizens surveyed in Guadalajara argue that the city should encourage efficiency in water distribution and consumption, rather than building costly and damaging projects. The same arguments can be used when debating the water diversion from El Zapotillo to the neighbour state of Guanajuato. In fact the water transfer to Leon, Guanajato, has a legal priority. The agreement to take advantage of the Rio Verde waters was signed in 1995, years before the project was enlarged to permit the supply to Guadalajara. As the protesters have been claiming for years, the project may not respond to the need of supplying water to the residents of cities. It seems designed to cater to the growing industrial activity of Leon. This is based on shoes production, chemical industry, automotive and the promotion of the new logistic facility of the Guanajuato Inland Port. Besides that, there is the interest of global construction corporations of Spanish and Mexican origin (Fomento de Construcciones y Contratas, Grupo Hermes Construccion and La Peninsular Compañía Constructora) in charge of building the dam. They also hold the concession of benefits from water distribution and management for 25 years. The conflict around the dam is also a conflict over water use privatisation. Against this background, the set of reasons held by the residents of threatened towns and their supporters has been manifold: historical, cultural, technical, economic, environmental, democratic, health-related, … They have brought them to the national debate through permanent campaigning, legal procedures, audiovisual production, community consultation and direct action. 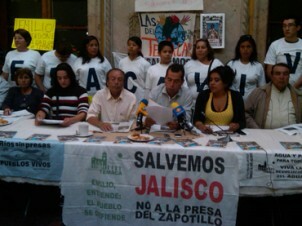 They have the support of the Mexican movement of people affected by dams and in defence of rivers (MAPDER). Temaca, as commonly known, has become one of the symbols of the anti-dam activism in Mexico and outside borders. In October 2010, the city was the venue of the Third International Meeting of Dam-Affected People and Their Allies. In that year, the campaign ‘The eyes of the world are watching Temaca’ was launched by International Rivers. Today we join the joy of the local residents and particularly the always active ‘Comité Salvemos Temacapulín, Acasico y Palmarejo’ [Let’s save Temacapulín, Acasico and Palmarejo Committee]. We are glad that the modest contribution of the EJOLT coordinator in their fight is mentioned in the position document. We support their claim to suspend the construction of El Zapotillo dam until an integral review of the project warranties that not only Temacapulín, but also Acasico and Palmareco, will be safe from flooding.